This is CrunchBang Linux installation guide for MSI Wind U270, but some tricks may also work on another Linux distros and other devices powered by AMD E2-1800 (or similar) processor. 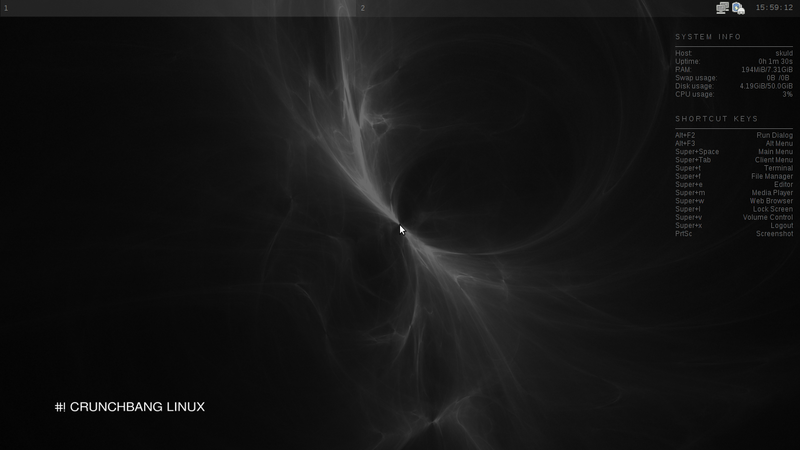 I chose this Linux for blazing fast performance, good essential app set and its simplicity. It starts quickly by using well-configured openBox and GRUB 1.98 <- who needs eye candy bootloader anyway? After start it uses less than 200MB RAM (Ubuntu eats over 500MB, Windows 7 about 1GB)! I recommend #! especially for netbook power users. IMHO CrunchBang is the best Linux distribution for MSI Wind U270 (I tryied Ubuntu, Xubuntu and Arch Linux). Get CrunchBang (this guide was written for #! 10 backported 64bit version but I recommend you to get the newest one) from download page and write iso file to pendrive (you can do it simply by UNetbootin or by dd command). Put pendrive in your netbook, check in BIOS that system boot from USB and restart machine. When prompted select installation and follow screen messages. I chose Polish language (for Polish keyboard, locale and chars) and made ext4 partition for / mount point and swap. UPDATE: I switched to SSD, so this time i chose ext4 with option noatime and without swap partition (I have 8GB physical memory). On my hardware out of the box #! had generic default graphics and there is no sound (start from CrunchBang 11 “Waldorf” there is native sound support), but with working Wifi and it was nearly fully functional for basic tasks with few essential and useful apps like ice-wheasel (Firefox), VLC, Gimp etc. After the first boot #! loads a custom script (if you miss it, run cb-welcome in terminal). You can update system and simply install some optional stuff like printer support, LibreOffice, version control tools (like git, svn and mercurial), LAMP, SSH server, Java etc. Make sure you have the latest 64 bit linux-headers and install latest fglrx or use smxi (check tutorial by el_koraco). Go to display manager -> DTV -> adjustment. Move slider to 0% and click Apply button. UPDATE: There is new CrunchBang version with sound working out of box so this section is obsolete. Download newest High Definition Audio Codecs from Realtek page. Unpack, and compile (readme file may be useful). Reboot machine, turn off mute (alsamixer command) and try some music and movies on VLC player. ATTENTION: only one application can use simple ALSA mechanism at the same time. To mix sounds from few apps consider installing pulseaudio server. I wanted to have Polish localization (special chars, currency and UTF-8 console chars) but system overall in English. To do so I run sudo dpkg-reconfigure locales (chose en_US.utf-8 and pl_PL.UTF-8 <-already selected). saved and logged out and in again to apply changes. If you don’t want system to be English you should try language-selector package. I like opera browser so I installed it from RMB on desktop->Network->WWW Browsers-> Install Opera (CrunchBang feature only). Try install your favorites apps from terminal. For example apt-get install mc for MidnightCommander. If you want create shortcut to application try out RMB on desktop -> Settings -> OpenBox -> Edit menu.xml (or GUI menu editor). I also installed Iron browser (secure version of Chromium) by download deb file from SRWare homepage. To add it to WWW Browsers menu (and remove Chrome entry) I edited /usr/bin/cb-x-www-browser-pipemenu file. To run programs in X (GUI) environment at system start modify ~/.config/openbox/autostart file. You can disable unused features or add your own favorite apps (music player, IM?). 255 value disable head parking, you can choose smaller number like 127 (head parks, but not so often). Be careful with moving around with netbook turned on! I had problem with USB 2.0 devices, especially #! couldn’t recognize and mount flash memories and USB external storages. The problem was card reader which drivers mess with USB. Enjoy your extremely fast Linux! This is my first post in English for wider audience. Please feel free to indicate me spelling or grammar mistakes, thanks in advance! Also, there is a very serious problem with MSI U-270: incorrect image proportions. More detailed, it sets 1024×600 resolution for 25×14 screen. 1024:600 is not 25:14, so, for example, squares will become rectangles, circles will become ellipses. Please, write if you know how to solve it. Another problem, which I noticed in Debian Squeeze and Wheezy, native video drivers don’t work at all, and proprietary drivers damage the picture if to switch between consoles. The native drivers in OpenBSD worked, but did not allow to switch between consoles at all and did not support 3D acceleration. Maybe OpenBSD was the best suitable free operating system for MSI U-270… I remember, Ubuntu did not want to run at all, the CD hanged while booting. But your post inspired me to try to return to Debian. I have MSI U-270 with 1366×768 screen and after installing drivers via smxi (follow tutorial link from Graphics section) it works like a harm with native resolution, good proportions and without consoles problem. I haven’t try OpenBSD yet. Good luck with your favorite system installation!